The library of songs being recorded with Buddy Cole was still steadily expanding and was being used for other subsidiary assembled programmes such as ‘The Navy Swings’ and ‘Stars for Defense’. It was raided again in 1960 when Bing and Rosemary Clooney teamed together in ‘The Bing Crosby – Rosemary Clooney Show’ on CBS. This was a 20 minute show aimed at female listeners and was broadcast at 11:40 a.m. Monday to Friday. Bing and Rosie would tape the dialogue weeks in advance and songs would be interpolated. The songs would usually feature Bing and Rosie singing solos and often a duet. Songs were repeated on many occasions. Murdo MacKenzie was again the producer. The shows commenced on February 29, 1960 and continued without a break until September 28, 1962 when Bing’s long association with radio in the USA effectively ended. Bing and Rosemary have worked out an almost foolproof system of parlaying work into fun and fun into money. Periodically they sit down in some pleasant environment and turn out material for some weeks of the 20 minute radio shows which are heard five days a week on the CBS network. The approach to these taping sessions is informal, just as it sounds on the air. There is a script, it is true. There are also numerous commercials which Rosemary usually rattles off whilst Bing grins smugly or stares stonily. By the time each of these meetings is ended, the floor is carpeted with pages of scripts and only the tape recorders know what is said. One of these Crosby - Clooney get-togethers was held recently in the Clooney home in Beverly Hills. While the engineer - Jack Lattig - tested tape recorders, amplifiers, mixers and microphones, Rosemary beguiled herself with a soft drink beneath a Vlaminck painting, leafing through her script. Comfortable sofas and easy chairs stressed the pleasant atmosphere of the spacious living room. Just before Bing arrived on this day, Bill Morrow who writes the scripts and hopes they will be followed within reason, explained what he tries to capture in the writing of the scripts. ‘We aim this at a lady’s audience’ he said. ‘Men are allowed to listen. The tone of the conversation has to be light and we also toss in odd bits of information.’ Murdo MacKenzie, the director of the show, tried to look solemn at this attempt to find logic in the Crosby - Clooney antics for radio. - the exercise break instead of coffee during business hours. Wherever they are taping - and this work has been done in Palm Springs, Las Vegas, Carmel, San Francisco and Seattle - they dress in comfort. This day Rosemary was wearing a colorful pair of slacks and a summer blouse. Bing brightened the room with a pink sports shirt. ‘I think,’ said Bing as he picked up his pile of scripts for the first time, ‘you might call this show flexible.’ Rosemary, who had been furrowing her brow over commercials for one of the four sponsors, burst into hearty laughter. They do not see their scripts until shortly before each session and neither of them bothers to look at the other’s lines. They try to grind out about a month’s supply of material at each meeting because they never know when they will be in the same city at the same time! It was agreed at this session that they would next cross tapes in London, and this they did. Under such conditions, slips are bound to occur, but they seem to give added freshness to the shows. During this session, Rosemary taunted Bing when he had difficulty in pronouncing ichthyologist. He bided his time, eventually caught her eye at an awkward moment, disconcerted her by quick mimicry so that she lost her place. She went through several sentences before the mistake was realized. As a result, the next three or four minutes were spent in crawling through the paper drifts, trying to locate the page she had discarded prematurely. Even the generally methodical Ken Carpenter is lured into false security by the general atmosphere of nonchalance. Once, certain that he had skipped a line, he and the others checked quickly through the script. It developed that a line had indeed been skipped. It was one of Bing’s. Each half hour or so, a roll of tape is filled and a fresh one loaded. This is an excuse for a general period of refreshment and a sense of awe fills the atmosphere as though another miracle has been worked. To add to the scene on this day, the children come running in from the swimming pool during these breaks. Sometimes during these breaks from recording, they postpone looking at their scripts for as long as possible, and swap information about experiences and personalities in show business. On this occasion the talk led to Marlene Dietrich. Rosemary reported that Miss Dietrich had spent much of her time slinking behind doorways and chairs. It had nothing to do with creating an exotic atmosphere. “I was fat” said Miss Dietrich. The present CBS show began in February 1960. There seems to be no intention of abandoning it as long as Rosemary and Bing can agree to meet somewhere for part of a day over some cool drinks and hot tape recorders. ‘...Eventually the big bands faded out as you know and one day Bing called me and asked me to go to CBS with him and a small group. He said ‘just you, I won’t do this unless you’ll do it.’ That’s just about the way Bing put it and I was naturally just thrilled out of my skull! And so we started with Mr. Crosby recording all of these tunes. That was in 1954 and we’ve been on the air continually except for one period of 9 months and one period of a year some place along the way. I started with Rosemary Clooney in 1953. She was on another network (NBC) but eventually she came over to CBS and we put Crosby and Clooney together and that’s the way it is today. I’m so thankful for this Crosby show that got started and I would break my back to stay on it all of my life. I wish I could be assured of that, I might have a little more hair than I have right now - but it’s a wonderful show to do. I go into a studio to record a basic track with Bing, or with Rosemary or both if they are doing duets. Now what I mean by that is just the rhythm, just the bass, guitar and drums and I’ll play piano or celeste or as little as I have to put in to give them some background. We do maybe 4, 6, 8, 10 - I’ve done as many as 20 songs in a day with Bing. A lot of these were head arrangements, not written. I write every one that I possibly can, you have to for things that are concerted, because then we come back at our leisure the next day or two or three days later. We play these things back through a speaker or on a headset and then set about adding instruments and other sounds. We can add - we can multiple all the electric guitar, organ, kettle drums, shot guns, chimes, whatever you want to add, sometimes we even sing! Bing Crosby Enterprises CD - "Songs I Wish I Had Sung (The First Time Around) (Deluxe edition)"
Bing Crosby Enterprises CD - "Bing Sings the Irving Berlin Songbook"
IT WAS 11:40 A.M. on Monday February 28, 1960—and the voice of Bing Crosby reached millions of listeners through the several hundred broadcast stations comprising the CBS Radio Network, as he introduced the first of a brand new series of music and commentary programs: The Crosby-Clooney Show. This was to be his last series on network radio. From the standpoint of numbers, it was also his most ambitious. A total of 675 Crosby-Clooney Shows were broadcast in the 135 weeks to follow! Each program was approximately 20 minutes long, following the Garry Moore Show with Durward Kirby, and preceding the CBS Twelve O’clock News. Five shows a week, Monday through Friday week after week, without a break. And this kind of production from a star whose attendance of the Kraft shows was studded with “vacations.” How was it done? Bing’s show budget—and hence his supporting cast and technical team—was minimal. He and Rosemary Clooney were co-stars; Bing was very scrupulous in dividing the singing chores exactly in two. Behind them was the group of regulars who worked with Bing for seven years following the end of the General Electric program in 1954: Buddy Cole and his combo, with Buddy Cole on the piano and electric organ, Nick Fatool on drums and a variety of other instruments/Perry Botkin [later replaced by Vince Terri] on guitar, banjo and other strings/ Don Whittaker on the bass. The versatility of this little group made them sound much bigger. They worked fast, recording on tape almost 500 different songs, all of which required arrangements and rehearsals. The announcer? Who else but faithful Ken Carpenter, who came aboard with Bing on the Kraft show in the mid-thirties and was there for the final, 675th program of Bing’s last radio series. But Ken was more than just the commercial announcer on this program. He, Bing and Rosie shared between them the topical comments, the humor, the intros and asides, even the commercials, which were often laced with musical parodies and little skits as well as straight ‘sell’. To make it all come together were the two production geniuses Bill Morrow and Murdo McKenzie . . .the same pair who handled production for Bing on his radio shows of the forties and fifties—Kraft, Philco, Chesterfield and General Electric. Bill developed the format and wrote copy where called for—there was a lot of ad lib in every program—and Murdo, with his scissors and editing spools, put all the pieces of music and dialogue together, snipping where necessary to make the timing come out “on the nose.” Yes, through the magic of audio tape (not a word was spoken live on the air!) this brilliant bunch of pros came up with a daily network show that not only held its own in the ratings game but crowned the last great daytime radio line-up. Preceding the ‘Crosby-Clooney Show’ were three of the radio/TV ‘biggies’ of the period—Arthur Godfrey, Art Linkletter and Garry Moore. Our man was supposed to carry their audiences through to the CBS news—and he did so with gusto. Bing was never more bubbly and up-beat than on this 20-minute stint. BING: Hello, everybody! Hi, Rosie. ROSIE: I’ll just do that little thing. KEN C: And what’s the selection, Rosie? BING: Time for us to move on out, Rosie. ROSIE: Yes, gotta go now, but we’ll be back at this same time tomorrow. THEME: “Side By Side” comes up behind Carpenter. 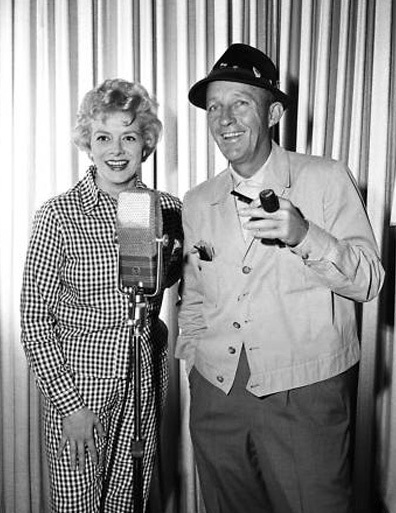 KEN C: Tune in tomorrow at this time for another session with Bing Crosby and Rosemary Clooney. This program was produced in Hollywood by Bill Morrow and Murdo McKenzie. Ken Carpenter speaking. THEME: Up and hold for timing. BREAK ANNCR: The Columbia Broadcasting System. Bing and Rosie met often at the studio, recording all the intros and dialogue as well as the duets. Some of Bing’s solos were borrowed from his nightly 15-minute show of 1954-56, “The Bing Crosby Show” (what else?). Other tapes came from the series “The Ford Road Show,” which came along in 1957. Rosie’s songs were sometimes borrowed from her own daytime program, “The Rosemary Clooney Show,” which also used Buddy Cole and his boys. And of course, Bing repeated. Oh, how he repeated! His solos and duets on these programs were repeated an average of only three times each, true, but this means that some were played ten times and others once. Rosie followed suit, but to a lesser degree. Even Buddy Cole repeated himself; his “Chloe” is found on a half-dozen of the shows. Uniquely, however, there were no guests, and all of the musical numbers were Bing-Buddy-Rosie creations, with a couple of exceptions. He and Rosie plugged their 1959 album “How The West Was Won” on a few shows, and their comic single “Isle of Capri” (1958) with Billy May’s Orchestra was used several times. Truly, the whole series was a monumental undertaking, but in character with a man who could, and did, cut 8 or 10 commercial recordings in a single day. Only the magic of tape made possible the Crosby-Clooney show, which was broadcast on CBS radio five days a week, Monday through Friday for 135 weeks straight without a break from February 29, 1960 through September 28, 1962. Bing was a pioneer of broadcast tape, and up to 1960 had amassed a huge quantity of tape recordings from various radio programs—from the Philco, Chesterfield and General Electric series, then the 15-minute evening programs logged as “The Bing Crosby Show”, and into a curious little five-minute program which was half-and-half: one song and one commercial, called the “Ford Road Shows.” These programs started on the air September 2, 1957, and circulated for a couple of years, to be followed by the final effort, the Crosby-Clooney 20-minute daytime program. Following the conclusion of the General Electric shows in 1954, Bing retrenched. Radio could no longer support a lavish ensemble of 22 top musicians headed by John Scott Trotter, and Bing adamantly refused to consider a TV series, which would put him back on the live-show treadmill. So, starting with his album “A Musical Autobiography” in 1954 it was Bing with Buddy Cole at the piano; Nick Fatool, percussions; Perry Botkin [later replaced by Vince Terri], strings; and Don Whittaker, bass. This combo could sound a lot bigger than it was - they even took vocal choruses when the occasion called for it, and Fatool had a collection of bells, chimes, and other effects which were worked into the arrangements. So, when Bing took on the Crosby-Clooney assignment, he was well-stocked with pre-taped program material. In addition, Rosemary Clooney had her own show on CBS, also using the Cole combo. Many of her tapes were spliced into the programs, since she and Bing shared the solos equally. Then Buddy and his group came in for some of the spotlight with instrumental numbers. Buddy made extensive use of his electric organ, which was a novelty at the time but has become dated. Wish Buddy had stuck with the piano! Unfortunately, it is impossible to put dates on the taping of many of the tracks used on these shows. Some went back to the mid-fifties. Others were lifted from the Ford show - still more were re-taped and there were some new ones cut, as revealed by the tapes of recording sessions in the 60’s. Sometimes Bing sang with the whole ensemble in the studio, but there were also tracks Bing made with a bell tone, the combo’s music to be laid in later. Bing and Rosemary made a string of fine duets together, which were used over and over. Everything had to come together on Murdo McKenzie’s splicing table, where the elements were balanced and laced together with topical comments by Bing, Rosie, and Ken Carpenter. A truly professional job! And now for the song titles. I wish I could say that the contents of every program on this series are known: unfortunately, about 18 percent of the shows, some 125 of the 675, have not been found. Until they come to light, we’ll have to be content with the 210 titles on the following list. They include Bing’s solos and his duets with Rosemary Clooney—no Clooney solos or Buddy Cole numbers. And none of the commercial LP’s that Bing occasionally slipped into a show for a free plug. What, you say? Only 210 different titles out of 550 shows? Yep, that’s right. Bing repeated his songs a number of times. So did Clooney, so did Cole. If you, fellow collector, have a few gems not on this list in your collection, won’t you send me the details? If possible, the program number and date along with information about the performance. We’ll add them. Songs in which Bing participated are denoted with an asterisk. We do not always have details of Rosie's songs but they are given where available. (a) Norcross Greeting Cards are promoted by Ken Carpenter. (a) General Electric sunlamps are promoted by Ken Carpenter. (b) Bing discusses the use of girls’ names for hurricanes. (a) The program is sponsored by Norcross Greeting Cards. (b) Bing and Ken Carpenter discuss an appropriate name for female astronauts. (c) General Electric sunlamps are promoted by Ken Carpenter. (a) The program is sponsored by General Electric Light bulbs and by Fels & Company. (b) Bing discusses recent advice to ladies by John Robert Powers about makeup and style. (a) Bing and Ken Carpenter discuss various scents and smells. (b) Norcross Greeting Cards are promoted by Ken Carpenter. (a) Bing and Ken Carpenter promote General Electric fluorescent tubes. (b) Bing and Ken Carpenter discuss the new deep frozen roses. (a) The program is sponsored by Norcross Greeting Cards, Fels & Company and GE night lights. (b) Bing and Ken Carpenter discuss the poet Robert Burns and his songs. (a) The program is sponsored by Fels & Company and GE light bulbs. (b) Bing and Ken Carpenter discuss colored bread. (b) The program is sponsored by Fels & Company and GE light bulbs. should not argue with their husbands. (b) Ken Carpenter tells Bing about a new pill that makes animals pleasant and friendly. (c) This is taken from the “How The West Was Won” album. (a) Bing and Ken Carpenter discuss the advent of spring. (a) Bing, Rosie and Ken Carpenter discuss a report about a temperamental opera singer. (a) The program is sponsored by Norcross Greeting Cards and by GE fluorescent tubes. (b) Bing and Ken Carpenter discuss the great blizzard of 1888. (b) Bing salutes a lady inventor who has developed a bracelet attacher. (b) Bing and Ken Carpenter discuss a method to stop termite damage. (a) Bing and Ken Carpenter discuss the city of the future. (b) This is taken from the “How The West Was Won” album. (b) Rosie tells Bing why women work harder than men. *How Am I To Know? (a) This is taken from the “Fancy Meeting You Here” album. (c) Ken Carpenter talks to Rosie about girls taking up dentistry. (a) Bing talks about the wettest place in the world. (b) Ken Carpenter talks to Rosie about girls getting parking tickets. (a) Ken Carpenter talks to Rosie about children’s stories. (b) The program is sponsored by Pennyshine and by GE light bulbs. (a) The program is sponsored by Norcross Greeting Cards and by GE light bulbs. (b) Ken Carpenter and Bing discuss various police forces. (a) Taken from the “Fancy Meeting You Here” album. (b) The program is sponsored by Pennyshine, Fels & Company and by GE light bulbs. (a) The program is sponsored by Norcross Greeting Cards, Fels & Company and by GE light bulbs. (b) Bing talks about Los Angeles being the Paris of California. (c) Taken from the “How The West Was Won” album. (a) The program is sponsored by Pennyshine, Fels & Company and GE light bulbs. (b) Bing talks about the potential Presidential candidates as described in Look magazine. (b) Bing talks about book sales including Anthony Armstrong Jones’ book of photos. (b) Bing and Ken Carpenter discuss electric wallpaper. (c) Taken from the “Fancy Meeting You Here” album. (b) Bing talks about old recipe books. (a) The program is sponsored by Norcross Greeting Cards, Fels & Company and GE light bulbs. (b) Bing talks about a matrimonial rating system. (a) Taken from the “How The West Was Won” album. (b) The program is sponsored by Pennyshine, Fels & Company and GE light bulbs..
(b) Bing talks about a young man who has found a very expensive diamond. (b) Bing talks about the ladies in Rome who wish to abolish the siesta. (a) The program is sponsored by Pennyshine. (b) Bing tells of the return of “Schultz the Butcher”. (b) Bing tells Rosie and Ken about bird carriages. (b) Bing talks about Tiros, a new communication satellite and suggests it could be used as a baby’s name. (b) Bing, Rosie and Ken talk about the possibility of a lady becoming President. (b) The program is sponsored by Norcross Greeting Cards. (c) Bing celebrates his birthday (sic) and talks about the forthcoming Kentucky Derby. (b) Rosie tells Bing about the female Dean of Students at Cornell University. *What Is There To Say? (a) Bing talks about police radio performers and later promotes The Crusade for Freedom. (b) The program is sponsored by Norcross Greeting Cards, Fels & Company and GE light bulbs. (a) Bing, Rosie and Ken talk about mail being sent by rocket and about a new type of human. (b) Bing, Rosie and Ken discuss the possibility of houses being built at the North and South Poles. (b) The program is sponsored by Norcross Greeting Cards and GE light bulbs. (c) Rosie tells the men about talking lengthening women’s lives. (b) Bing gives details of the use of music by dentists. (b) Bing talks about nervous bridegrooms. (a) Bing talks about the age of the Solar System. (b) Bing describes a sign at Manila airport encouraging people to kiss goodbye. (b) Bing talks about the new Irish policewomen. (b) It's Rosie's birthday and she and Bing discuss whistling. (a) The program is sponsored by Pennyshine and by Fels & Company. (b) Bing talks about 5th Avenue in New York which now features a deluxe shoe shine salon for ladies. (a) The program is sponsored by Norcross Greeting Cards and by Fels & Company. (b) Bing talks about a radio contained in a fishing rod. (b) The program is sponsored by Pennyshine, Fels & Company and GE light bulbs. (c) Bing describes how a “little old lady” saved a London policeman recently. (a) A sung commercial. The program is sponsored by Fels & Company and GE light bulbs. (b) Bing talks about bottle nosed dolphins. (b) Ken Carpenter describes an electronic device which can pick up a conversation a hundred miles away. (b) Bing, Rosie and Ken discuss the recent public holiday. (b) Bing and Rosie discuss the wedding presents given to Princess Margaret and Anthony Armstrong Jones. (b) Bing and Rosie talk about charmed lives. (b) Taken from the “Fancy Meeting You Here” album. (c) The program is sponsored by Fels & Company and GE light bulbs. (d) Bing, Ken and Rosie talk about seagulls digging clams. (b) Bing, Ken and Rosie discuss inventions. *What Is This Thing Called Love? *How Long Has This Been Going On? (a) The program is sponsored by Fels & Company. (b) Ken explains how jet pilots will be eating while flying in future. (a) The program is sponsored by Fels & Company, Cheerios, Eastern Products Corporation and by D-zerta Puddings. (b) The program is sponsored by Cheerios and by Eastern Products Corporation. (c) Bing, Ken and Rosie talk about women living longer than men. (a) The program is sponsored by Dr. Scholl, Cheerios and by Eastern Products Corporation. (a) The program is sponsored by Fels & Company, Cheerios and by Eastern Products Corporation. (b) Bing, Ken and Rosie talk about snow storms. (a) The program is sponsored by Squirt (the drink with the happy taste) and by Cheerios. (b) Ken tells Bing and Rosie about air-conditioned people. (a) The program is sponsored by Cheerios and by D-zerta Puddings. (b) Bing talks about air-conditioned suits. (a) The program is sponsored by Squirt (the drink with the happy taste), Sara Lee and by Cheerios. (a) The program is sponsored by Cheerios, Sara Lee and by Matey. (b) Bing, Ken and Rosie discuss the importance of radio. (a) The program is sponsored by Cheerios. (b) Bing, Ken and Rosie talk about business graduates. (a) The program is sponsored by Cheerios and by D-zerta Jelly. (b) Bing talks about the Texas Navy with Ken and Rosie. (a) The program is sponsored by Cheerios and Sara Lee. (b) Bing tells Rosie and Ken that there are 61 million cars registered in the USA. (a) The program is sponsored by Sara Lee. (b) Bing talks about a driver convicted for inhaling glue. (a) The program is sponsored by Seven-Up. (b) Bing tells Ken and Rosie about South Euclid, Ohio where the police nearly ran out of traffic tickets. (a) Rosie tells Bing and Ken about her hairdresser. (a) Ken, Bing and Rosie discuss the significance of the fact that men out-faint women three to one during Las Vegas marriages. (b) The program is sponsored by D-zerta and Eastern Products Corporation. (b) Bing, Ken and Rosie follow up their earlier discussion about men fainting at the altar. (a) The program is sponsored by Sara Lee, Matey and by Eastern Products Corporation. (b) Bing, Ken and Rosie continue their earlier discussions about men fainting at the altar. (a) The program is sponsored by Eastern Products Corporation. (b) Bing talks about the eccentric behaviour of salmon after a still has overflowed into their stream. (b) Bing, Ken and Rosie discuss the accidental dumping of whiskey into a salmon fishing river. (a) The program is sponsored by D-zerta and Eastern Products Corporation. (b) Bing, Ken and Rosie talk about soccer being taken up in the USA. (a) The program is sponsored by Sara Lee and Cat’s Paw Shoe Repairers. (b) Ken tells Bing and Rosie about a boy winning the national spelling bee competition. (b) The program is sponsored by Sara Lee and Eastern Products Corporation. (c) Ken tells Rosie and Bing about some facts and figures concerning eye glasses. (a) Bing, Ken and Rosie talk about the popularity of radio and a “mad slasher”. (b) The program is sponsored by Four-Way cold tablets and Eastern Products Corporation. (b) The program is sponsored by the Saturday Evening Post, Four-Way cold tablets and Cat’s Paw Shoe Repairers. (c) Ken tells Bing and Rosie about North Park, California which has removed parking meters. (a) Ken tells Bing and Rosie about duck shoes. (b) The program is sponsored by D-zerta, Four-Way cold tablets and Eastern Products Corporation. (a) The program is sponsored by Sara Lee, Four-Way cold tablets and Cat’s Paw Shoe Repairers. (b) Ken challenges Bing to guess how much women spend on lipstick in a year. (a) The program is sponsored by Sara Lee, Four-Way cold tablets, Matey and Eastern Products Corporation. (a) Bing tells of a physical therapist who recommends an exercise break instead of coffee during business hours. (a) Bing, Rosie and Ken do exercises. (b) The program is sponsored by Cat’s Paw Shoe Repairers and Four-Way cold tablets. (a) Ken tells Bing and Rosie how much women spend on beauty salons and cosmetics. (b) Bing, Ken and Rosie follow up their discussion about beauty salons and cosmetics. (a) The program is sponsored by Sara Lee, Four-Way cold tablets and Eastern Products Corporation. (b) Bing, Ken and Rosie discuss the early beauty parlours. (a) Bing talks about cuffola (non payment) as a status symbol in dealing with British tailors. (a) Bing tells about a cat that became trapped in an automatic washing machine. (a) Rosie tells about a set of rules for housewives to keep in shape. (a) Rosie again talks about housewives keeping in shape. (b) The program is sponsored by Sara Lee, Four-Way cold tablets and Cat’s Paw Shoe Repairers. (a) The program is sponsored by Matey, Four-Way cold tablets, Sara Lee and Eastern Products Corporation. (a) Bing, Ken and Rosie talk about London tailors sending bills out. (a) Bing gives details of a lady who won a battle with the tax collector. (a) The program is sponsored by Del Monte, D-zerta, Four-Way cold tablets and Eastern Products Corporation. (a) The program is sponsored by Del Monte, Four-Way cold tablets, Sara Lee and Cat’s Paw Shoe Repairers. (a) The program is sponsored by Del Monte, Four-Way cold tablets, Sara Lee and Eastern Products Corporation. (a) The program is sponsored by Four-Way cold tablets and Eastern Products Corporation. (b) Ken gives details of bootees for cows. (a) Ken talks about a vacuum cleaner costing $320,000. (b) The program is sponsored by Del Monte, Four-Way cold tablets, Cat’s Paw Shoe Repairers and Sara Lee. (a) Bing, Ken and Rosie talk about bubble baths for cows. (a) Bing, Ken and Rosie discuss hair brushes for chinchillas. (a) Bing, Ken and Rosie talk about diplomats. (a) Bing, Ken and Rosie highlight new gadgets to help housewives. (b) The program is sponsored by Four-Way cold tablets, Cat’s Paw Shoe Repairers and Sara Lee. (b) Ken tells Bing and Rosie that the average woman in the USA will not buy perfume for herself. (c) The program is sponsored by Four-Way cold tablets and Eastern Products Corporation. (a) The program is sponsored by the Home Care Plan, Cat’s Paw Shoe Repairers and Four-Way cold tablets. (b) Bing, Rosie and Ken talk about their plans for Halloween. (a) The program is sponsored by D-zerta, Four-Way cold tablets and Eastern Products Corporation. (a) Bing, Ken and Rosie talk about accidents at home. (b) The program is sponsored by Four-Way cold tablets, Sara Lee and Eastern Products Corporation. (a) Ken gives details of a duck and a dog who are friends. (a) The program is sponsored by the Saturday Evening Post, Cat’s Paw Shoe Repairers and Four-Way cold tablets. (a) Ken leads a discussion about electric carving knives. (a) Ken tells that blondes are disappearing in France. (a) Ken tells about an attachment for washing machines which can be used to dry hair. (a) Bing tells Ken and Rosie about new plastic packaging for soft drinks. (a) Bing leads a discussion about blondes disappearing. (a) Rosie tells of a place where there are 5 sets of twins in the same block. (a) The program is sponsored by Matey, Sara Lee and Eastern Products Corporation. (a) Ken leads a discussion about career women. (a) The program is sponsored by Cat’s Paw Shoe Repairers and Four-Way cold tablets. (b) Ken tells of a ladies hat costing $475. (b) Ken tells Bing and Rosie about a new gadget called a rocket belt. (c) The program is sponsored by D-zerta, Four-Way cold tablets and Eastern Products Corporation. (a) It is Thanksgiving Day and the participants discuss their forthcoming meals. (a) Ken tells Bing and Rosie that the average woman spends 7 years of her life looking at herself in a mirror. (a) The program is sponsored by Mojud Seamless Supreme, Four-Way cold tablets and Eastern Products Corporation. (b) Rosie tells the men that the housewife now takes the lead in family budgeting. (b) Bing, Ken and Rosie discuss gardening. (a) Bing, Ken and Rosie discuss the absence of lady barbers. (a) The program is sponsored by Mojud Seamless Supreme, Four-Way cold tablets, Sara Lee and Cat’s Paw Shoe Repairers. (b) The program is sponsored by Matey, Four-Way cold tablets, Sara Lee and Eastern Products Corporation. (b) The program is sponsored by Mojud Seamless Supreme, Four-Way cold tablets and Eastern Products Corporation. (c) Bing describes a new type of automated chopsticks. (b) Rosie tells of a new type of drinking straw. (a) Rosie talks about ladies beauty trends. (b) The program is sponsored by D-zerta and Four-Way cold tablets. (a) Bing tells of ‘Safety Tub’ which is designed to prevent slipping in the bath. (b) The program is sponsored by Four-Way cold tablets. (a) The program is sponsored by Mojud Seamless Supreme and Four-Way cold tablets. (b) Rosie tells more about forthcoming revolutions in the beauty business. (a) The program is sponsored by Kiwi Boot Polish, Cat’s Paw Shoe Repairers and Four-Way cold tablets. (b) Bing, Ken and Rosie talk about Banks making their premises more attractive to ladies. (a) Bing, Ken and Rosie continue their discussion about Banks making their premises more attractive to ladies. (a) The program is sponsored by Mojud Seamless Supreme, Four-Way cold tablets and Sara Lee. (b) Rosie suggests that flavored lipsticks might be a good idea. (a) The program is sponsored by Matey, Four-Way cold tablets and Sara Lee. (b) Bing talks about the fastest ever postal delivery. (b) Bing talks about the new vibrating barbells. (a) This is taken from the “How The West Was Won” album. (a) This is taken from the "Fancy Meeting You Here" album. (a) The program is sponsored by Cat’s Paw Shoe Repairers. (b) Bing, Ken and Rosie talk about the “Twist” dance craze. (a) The program is sponsored by Wrigley’s Spearmint Gum, Ry-Krisp and Four-Way cold tablets. (b) Bing talks about possible holidays for Rosie. (a) The program is sponsored by Four-Way cold tablets and Cat’s Paw Shoe Repairers. (b) Bing describes an easy way to open oysters. (b) Bing talks about Melina Mercouri. (a) The program is sponsored by Wrigley’s Spearmint Gum, Ry-Krisp and DuPont Dacron. (b) Rosie says that women drivers are not going to be a joke anymore. (b) The program is sponsored by Cat’s Paw Shoe Repairers and DuPont Dacron. (c) Bing talks about a new bagel slicer. (b) Rosie informs Bing and Ken that females now outnumber males in the USA. (a) The program is sponsored by Cat’s Paw Shoe Repairers and DuPont Dacron. (b) Ken reminds Bing and Rosie that tax time is here again. (b) The program is sponsored by Wrigley’s Spearmint Gum, Ry-Krisp and DuPont Dacron. (a) The program is sponsored by Wrigley’s Spearmint Gum and Ry-Krisp. (b) Rosie gives details of a “Rent-a-cocktail-party” service. (b) Rosie tells of high praise for American women from a French magazine. (b) Bing, Ken and Rosie talk about women drivers. (a) The program is sponsored by Royal Edge and Royal Lining Paper, and Cat’s Paw Shoe Repairers. (b) Rosie explains that it is best to buy shoes after 4 p.m. because feet expand during the day. (b) Bing, Ken and Rosie talk about the “Twist” again. (a) The program is sponsored by Wrigley’s Spearmint Gum and Cat’s Paw Shoe Repairers. (b) Rosie tells that it is possible to rent a subway train in New York. (a) The program is sponsored by Mojud Seamless Supreme and Royal Edge and Royal Lining Paper. (b) Ken tells about a new damage recorder for packages. (a) The program is sponsored by Royal Edge and Royal Lining Paper, Good Housekeeping and Cat’s Paw Shoe Repairers. (b) Bing tells of a man who has had problems with his TV set. (a) The program is sponsored by Wrigley’s Spearmint Gum. and discusses other matters relating to the day. (a) The program is sponsored by Wrigley’s Spearmint Gum and Good Housekeeping. (b) Bing advises that whale meat is now being made more attractive for eating. (b) Rosie gives details of a new floor washer and drier. (a) The program is sponsored by Good Housekeeping, Wrigley’s Spearmint Gum and Royal Edge and Royal Lining Paper. (b) Bing, Ken and Rosie discuss dreaming. (b) Rosie tells of a lady who gave a party for 34 in a two-room apartment. (b) Bing says that he likes ladies wearing frills and a discussion ensues. (a) The program is sponsored by Mojud Seamless Supreme, Wrigley’s Spearmint Gum, and Royal Edge and Royal Lining Paper. (b) Rosie suggests a method of allocating a rota for the use of the bathroom by children. (b) The program is sponsored by Royal Edge and Royal Lining Paper, and Cat’s Paw Shoe Repairers. (c) Bing queries what has happened to calendar girls. (b) Bing passes on advice from the UK about dealing with rodents. (a) The program is sponsored by Mojud Seamless Supreme and Wrigley’s Spearmint Gum. (b) Bing passes on a tip for planting plants. (b) Bing gives details of the amount of soup being consumed each year.